Every so often I’ll have something to give away, be it a copy of my latest book, a bookmark, or maybe someone else’s book. 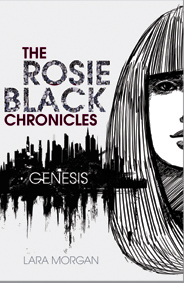 Check out the new Facebook page for Rosie Black. We have 10 signed copies to give away. All you have to do is follow the simple instructions and answer a questions. Go now! Most of the weird things that have happened in my life have also been embellished with the label of “cool” or “awesome”, too. So…saying which is the WEIRDEST thing that has happened to me is difficult to answer. I remember feeling physic a few times in the past, or having REALLY good timing with some of my good friends. Like once, I thought to call my friend, but her phone was out–she was calling me! Insane! Does having 8 kids count – all boys…and some of them are VERY strange…..
8! Wow you must be busy. I think this does count. I was swimming in a dirty ‘water hole’ at Bathurst Island – keeping an eye out for nasty crocs or whatever, when one of the tour members asked me if I was a ‘Cameron’. My Mother’s family are WA Cameron’s and as I have lived all my life in VIC’ I was amazed that a local recognised the ‘Cameron ‘ face – thin Scottish mouth etc. This particular person was a relative ‘by marriage’ – a RIL. The Cameron face is more recognisable with wet hair slicked back – not a good look. You have probably recognised that I am Kath W’s cousin, and I presume that you are the bride in her Facebook. Great photo. The world is very small. Hi Heather! Yes I am ‘that’ bride. I’ll be telling Kath you tracked me down when I see her. thanks. Lara, this is one of the strangest things that has happened to me – I wrote a children’s novel set on a dinosaur fossil dig in western Queensland based on an imaginary, small dinosaur that would have lived in the area 95 million years ago (based on it’s footprints in the rock at Lark Quarry Dinosaur Stampede). The fossils of this small species have never been found – hence its name, Wintonopus (meaning footprint). In my story the main character, a girl called Ellie, finds the actual fossil evidence of the dinosaur. Then, just before my book was published in 2006, a piece of dinosaur bone was unearthed. Yes, it was the missing dinosaur! I was thrilled to bits, and added the info at the back of the book in the Author’s note section. Maybe they should have named it Elli-osaurus. Meeting and being friends with my best friend/”twin”. Too many coincidences! We both have the exactly the same birthday, with only a few MINUTES (!) difference for our birth time. Let’s say if my house number is 12, his is 21. -__- We have a lot common likes and dislikes, and sometimes have the same opinion. Sometimes even our personalities are the same. His mom and my mom are from the same hometown, I think they majored the same thing in college too. When we were classmates, we’ve been randomly assigned to sit next to each other in class, twice times, two different years, by two different teachers. Well there are a lot more, can’t remember too much right now lol. That’s why we call each other twin, non-biological twins lol. So i’m sitting here one night, trying to work on the WIP when a thumping comes from my son’s room next door. He’s three and has an old rocking horse in there. Hubby heard it too and came from the lounge. “He’s in trouble,” I said. He should have been asleep hours earlier. We listened to the rhythmic thumping of the wooden horse on our floor boards. As one, we pushed the bedroom door open, ready to catch our son in the act. He was sound asleep. Needed to be shaken awake. Oh, and I can’t wait to read your book!! It sounds great! This is just plain weird, and I’m sure if I think about it more, I can come up with something more, I don’t know, importantly strange that’s happened, but this was so random that I’ve always remembered it. Maybe 7 or 8 years ago, I woke up one morning thinking “Boca Raton” (city in Florida — I live in Michigan, so no where near). I turned on the tv and there was an informercial on, and the first thing I heard them say was Boca Raton. Just plain weird. the Twilight Zone music is playing in my head now I’ve read that. Many years ago when I was staying in a hostel in Paris, one of my dorm mates (who I’d never met before), did a tarot reading for me, and was so accurate, it was amazing. Really freaked me out, but in an OMG way. the strangest thing that has ever happened to me actully still happens. My sister and i are realy only half sisters and are seperated by 8 years and we thinkj exactly the same. for example we were at a camp couple of years ago and we were talking about what we would take to a desert island and at the same time we both said we would take a water purifier i think that if i have to change it i would put down a knife but she changed hers…to a knife! wow. thats soooo weird. scary. Hi your storys are really amazing i just finished reading the second rosie black chronicals and i cant wait for the third one to come out i am in year nine but your storys have really inspired me to write I love writing storys like yours the adventure and romance type thanks for being an awesome author p.s its really cool how your story was based in perth I cant wait for the third story to come out!! The strangest thing that happend to me was when we were in England walking in the hills and there was a closed down bath house that used to operate many years ago, we were telling scary storys to each other about how an old woman lives in there and makes potions we went up to it and the sign said closed but we peered in then i thought i saw a bird in there but it was in fact a woman who came up to the door telling us to go because it was closed gave me a fright!! !